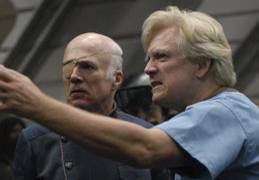 1/9/07: Bruce Davison (X-Men) appears as Dr. Robert. Athena pays a visit to Baltar's Six, who has her very own bed in the brig. Helo and Athena talk down in a crowded hangar deck. Later, in the same scene, Helo has pulled his sidearm, while security holds off the civilians. Tigh listens to an intense Dr. Robert. 1/1/07: A "Helo" episode where he does something that is apart from his relationship with Athena. 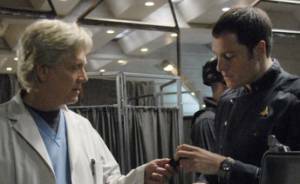 10/21/06: Doctor Robert's medical facility might actually be located on the lower decks of Galactica. 10/12/06: When Helo attempts to move a heavily sedated Hot Dog from Doctor Robert's care, Doctor Robert intervenes by ordering Marines in. Just then Tigh and Cottle arrive, and to Robert's surprise Tigh turns on him. Cottle admits to Helo that he finally did the an autopsy on Willie and found that he died of acute apoptosis, while Buckminster was suffocated. Dr. Robert says that he had only six months to live and he was saving medicine for those who could really use it. Cottle says that they had anemia. Robert then goes on a rant against Saggitarons and blames the genetic condition on their attitude. [Remember, Zarek is a Saggitaron and they have long been looked down upon by the other colonies.] Robert says that he was going to save Hot Dog because he was a pilot and unlike most Sagittarons, willing to defend humanity. 10/12/06: Doctor Robert and Tigh know each and are on friendly terms. Doctor Robert commands Marines, which would seem to indicate that he's in the military structure. Whether or not he's still XO of Galactica, Tigh appears to still be part of the military command since he gives orders to the Marines and Helo. 10/12/06: Dr. Robert had to suture a wound of some kind that Hera had. 9/27/06: Guest cast listed as: Sykes/Burrell, Willie, Portia King, Doctor Robert, Buckminster, Buckminster's Father, Scorpion. 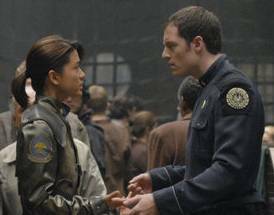 9/27/06: Preliminary Episode Synopsis: Medical care in the fleet is dismal with shortages of medical supplies and practioners. After one such death, a mother is suspicious of the autoposy results. Helo investigates a particular ship's doctor, who seems to discriminate in his treatment of fellow Saggitarons. Helo's daughter Hera ends up under the doctor's care. Hot Dog also comes under the doctor's care. 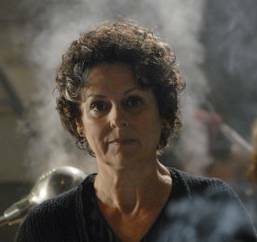 When Helo learns that he isn't doing well, he attempts to have him transferred to Doctor Cottle's care, but the doctor and guards stop him. 9/27/06: Working Episode title added.